Hellenika covers 411-362BC, the final years and aftermath of the Peloponnesian War. This edition has everything: maps galore, illustrations, many illustrative photos of ancient sites (in b&w), footnotes, detailed appendixes of other related and relevant texts, bibliography, index, glossary, side summary notes for every paragraph, individual page title headings, timelines etc, etc. One might say that the text itself is rather swamped by all this extra information but I think the text is such a detailed catalogue of events anyway that the extra information really helps the reader to follow what is going on and put things in context. A superb edition. Cartwright, Mark. 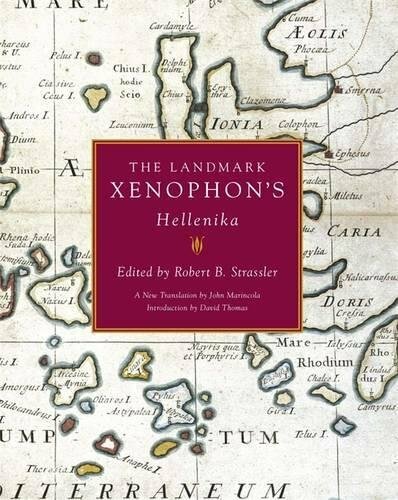 "The Landmark Xenophon's Hellenika." Ancient History Encyclopedia. Last modified May 09, 2012. https://www.ancient.eu/review/3/. Cartwright, Mark. "The Landmark Xenophon's Hellenika." Ancient History Encyclopedia. Ancient History Encyclopedia, 09 May 2012. Web. 20 Apr 2019.